Royal Canin Urinary S/O Moderate Calorie Dry Food for Cats is a complete and balanced vet diet for overweight, neutered or inactive cats, to help treat kidney stones and bladder problems. 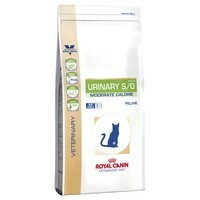 Made with a specially formulated recipe with a reduced calorie content to help limit weight gain, Royal Canin Urinary Veterinary Diet helps with the dissolution of struvite uroliths, and reduces the risk of recurrent struvite and calcium oxalate urolithiasis. Our cats love it - 10 year old male had some issues and the vet recommended it - he loves it. Our second cat who is a few years younger loves it to, and also benefits from the "moderate calories"!! Best thing ever. This food has 'looked after' my male cat very well. Mainstream shop dried food causes my cat to bleed a little during urination, this food stops it and now prevents it. He loves it too. My 2 elderly cats loved this food but it turned out to be the main culprit for runny poo in both cats and increased cystitis in the problem cat. It took us many months to determine that the dry urinary food was the problem. We now stick with wet urinary pouches and my cats are totally back to normal (normal poo and the cystitis has completely gone). The may work for some cats, but it didn't work for mine.